The Psion PDA computer were, in my opinion, the best range of PDA devices ever produced. They were flexible, had a good range of software, utilised a proper keyboard and were very reliable. Unfortunately, the might and power of Microsoft powered devices took over and we're left with the boring, unreliable PDA devices we see these days. This page serves as a central resource for all things Psion, as well as providing links to download some of my own software I've written for Psion machines over the years. 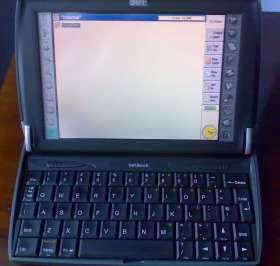 The Psion NetBook in its day was an amazing sub-notebook sized clamshell computer with VGA touch sensitive screen and StrongARM processor. It's battery life of between 10 and 12 hours gives even todays hand-held computers, such as the Asus Eee PC, a run for their money. They can be picked up second-hand for under £200 if you shop around, so I would argue that they're a better device than the Eee. The NetBook is powered by an Intel SA-1100 StrongARM processor running at 190MHz and has 32MB of RAM fitted as standard. This is expandible to 64MB. The touchscreen is 7.7" diagonal screen size with a resolution of 640 x 480 pixels. It runs EPOC32 ER5 as an operating system. The NetBook has a standard (16 bit) PCMCIA slot and a Compact Flash slot. It has a serial port capable of speeds of up to 115200 baud. 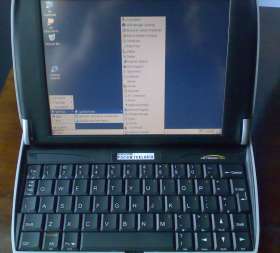 The NetBook Pro was an enhancement of the original NetBook hand-held computer featuring a higher resolution screen, USB port, more memory and a faster processor. The main downside was that Psion dropped EPOC in favour of Windows CE - a move many people argued was a retrograde step. The NetBook pro is powered by an Intel XScale PXA255 processor running at 400MHz and has 32MB of Flash RAM with 128MB SDRAM fitted as standard. The touchscreen is 7.7" diagonal screen size with a resolution of 800 x 600. Being TFT it has better visibility in daylight than the original NetBook. It runs Microsoft Windows CE.NET 4.20 as an operating system. The NetBook Pro has a standard (16 bit) PCMCIA slot and a Compact Flash slot. It has a serial port capable of speeds of up to 115200 baud, a single mini USB 1.1 master and a 2.5mm stereo headphone/mic socket. The backup batteries are two standard AAA type. Latest WinCE 4.20 ROM image - The last released ROM image for the NetBook Pro [19MB ZIP] See Expansys Support Forum for list of features and download. If the worst happens and your Psion stops functioning, there are a few repairers still around who may be able to fix your little device. Please note that I no longer repair Psions myself, but I've provided the following links for your information. Pinnock Organiser Services (POS) Ltd. - Also fix iPods, XDA etc. Psionflexi - Small independent repair company specialisiing in Psions. Psion Teklogix - Psion's own international repair department. Here is my most popular Shareware applications for Psion palmtop computers. Clicking on the relevant title will take you to the web page for that application, which will provide more information. ArcLink5 - A RISC OS application for transferring files to and from the Psion EPOC palmtop computers. It has been tested with the Psion 5, 5mx, Series 7, Netbook and Revo models. PsiOrg - Translate Psion 5 'Data' address book files into a format suitable for importing into Chris Morisons excellent !Organiser application. Psion - Transfer files to and from the original Psion II pocket computer. Source code in BASIC is provided so that people may like to fiddle to see if it works with later Psions.